During a recent course in Barcelona where delegates were being trained on how to tackle international markets, I asked everyone if keyword research is really that important. After all, it seems that the vast majority of digital agencies and clients directly translate their keywords and therefore base their international strategies on the market they come from. So what did the delegates answer? Keywords are indeed the backbone of your digital marketing campaigns, and jeopardising your chances of success just to save a few bucks at the initial stages of international expansion certainly isn’t the right way to go. 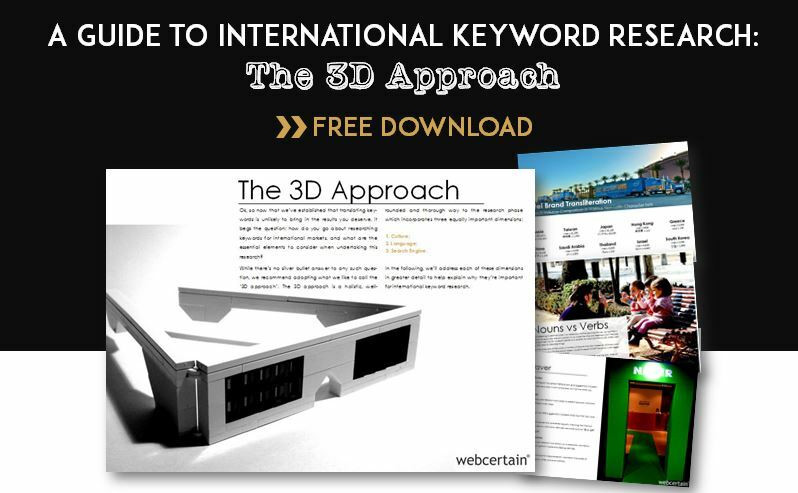 Whether you undertake keyword research for clients or do it yourself in-house, I recommend following what we at Webcertain like to call the ‘3D approach’. 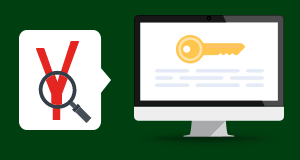 We’ve created a 35 pages guide to international keyword research (which is based on this approach), and I strongly encourage you to go download it (it’s free). If you’re not yet convinced however, you’ll find a shortened version of the 3D approach below. …and these things combined greatly influence the way people communicate, including the way people search. Which bears closest resemblance to the wooden cylinder in the middle of the above image – the cylinder made of blue composite to the left, or the rectangular piece made of wood to the right? In a video made by EBS English, they asked Westerners and Easterners this very question – and it turns out the answer varies substantially depending on which group you ask. Westerners, usually more focused on the shape of an object than its substance, would overwhelmingly pick the cylinder made of blue composite, in spite of the fact that the substance/material was different. For Easterners, however, the substance overruled the shape. So even though the shape differed, as is the case with the rectangular object to the right, Easterners were much more likely to pick this over the cylinder made of blue composite. It is interesting to see that when you observe a mother playing with her young child in the US, for example, she will typically try to make the little one describe what they are taking in their hands – a plastic spade or a bucket, for instance. Nouns are widely used as they tend to describe things. On the other side of the world, a mother will ensure that she makes her child say what they want to do with the actual object: Cook? Sweep? Write? The action is privileged over the object used for the action. What on Earth does this have to do with keyword research? We can notice that 65% of the returned results in Google’s Keyword Planner are about the shape of the skirt, then the material (19%). 63% of the top 14 results are about what you want to do with the actual dress – i.e. action – followed by quite generic keywords, which make up 30% of search volume. If direct translation was a truly viable way to go about keywords, we would have equivalent search terms in Simplified Chinese, no? Or at the very least identical keyword categories? Well, this is the work of culture, and it serves as an evident illustration of the shortcomings of merely translating keywords. This is mainly for your brand or for your product names. Taking into consideration both transliterated and non-transliterated versions of branded keywords will not only give you a good overview on the actual popularity of your product / brand, it will also help you realise how you need to incorporate those keywords in your international online marketing strategy. 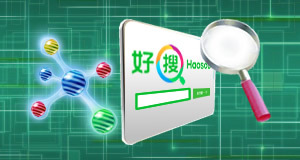 Search engines are often able to make the link between those words with no accents and their correct versions. Often – that is, not always. It would be a shame to miss opportunities because you haven’t had a look into the matter. While I would reserve keywords with dropped accents for PPC, I would still consider them to get a true reflection of the popularity of keywords, especially for content marketing creation. When you conduct keyword research to understand what would be the next piece of content you need to create, imagine you only have a look at the correct spelling of the following keyword: rätsellösung. With 590 average monthly searches, you might think, it is not worth it, right? What about having a look at this version now: rätsel lösung. 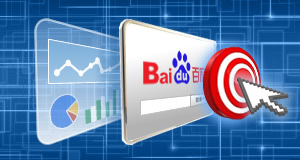 It shows 1,900 average searches per month. It must mean that German internet users are actually searching for this kind of topic as the total of searches is 2,490. Targeting Japan will require you to bear in mind the existence of 3 different Japanese scripts. Pair up with a native language specialist to make sure that all relevant options are examined. In some languages, Slavic and Finnic languages in particular, words bear different inflections depending on their grammatical function in a sentence. You will have to pay special attention to grammatical cases while carrying out keyword research for languages that use extended case systems. Search engines were first designed for specific markets and therefore behave differently from one another. 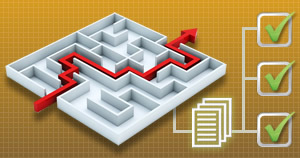 Their keyword research tools reflect those differences as well. 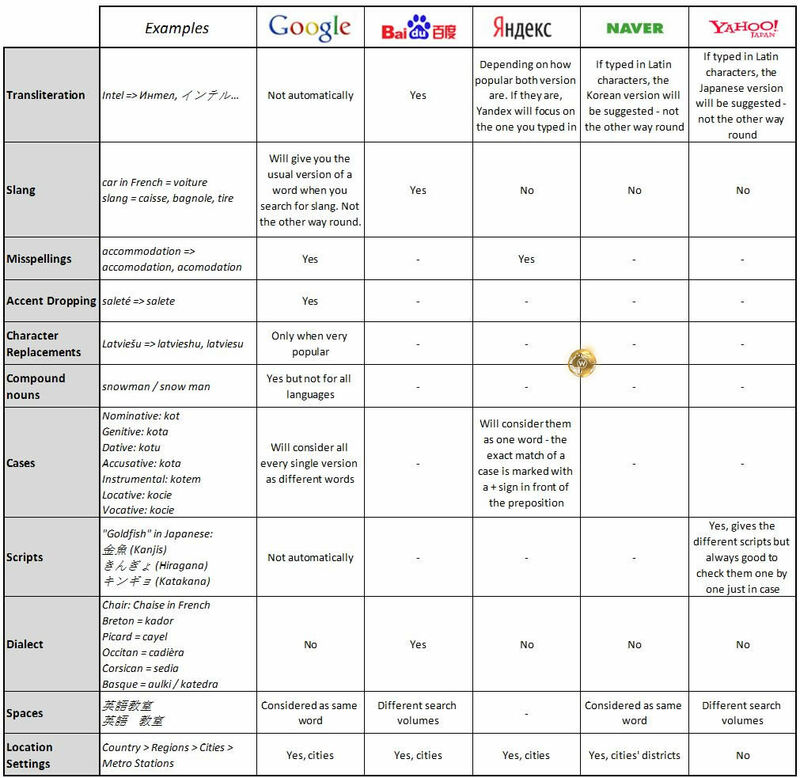 Here is a table showing what the keyword research tools made available by Google, Yandex, Naver, Baidu and Yahoo! Japan can provide, and what you need to focus on while conducting keyword research for those markets. Options vary from one search engine to the other, but differences will also be noted from one language to the next. Google for instance is really good for some languages and needs improvement for some others. It is crucial to take into consideration those differences as you might want to run a campaign on both Google and Yahoo! Japan – in this case, you might want to conduct two separate keyword researches. And, as always, never assume anything when researching keywords: explore, discover and be successful! 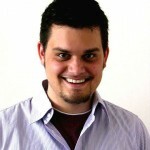 Ben is the Director of Business Solutions at Webcertain. 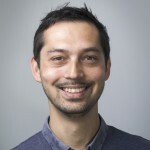 With an extensive linguistic background, and over four years of hands-on search experience, Ben is a regular speaker at the International Search Summit and is one of the tutors at the International Marketing School. Familiar with a variety of different industry sectors and digital channels, he also makes sure that all clients’ international digital marketing strategies have been appropriately adapted to each target market. Ben’s areas of expertise are PPC, SMO, SEO, online PR and link building applied to international and multilingual markets and project management. Thanks for this article! It put into words what I had already guessed about keyword research when companies are looking to expand internationally. The difference between Westerners and Easterners was quite helpful. Ben, I love your article, it’s very informative and well-written! From my experience, word inflection in Slavic languages plays a role mostly in exact match keywords, while Google does a good job in identifying different word modification in a broad match. The Ultimate Guide To Yandex Metrica – The Update!